I fell in love with a pretty blue and green print from DS Quilts in the quilt fabric section of Jo-Ann’s a few months ago. I was disappointed to discover that there wasn’t enough yardage left for a dress. Several weeks later, it occurred to me to make a blouse instead. Fortunately, the fabric was still available. 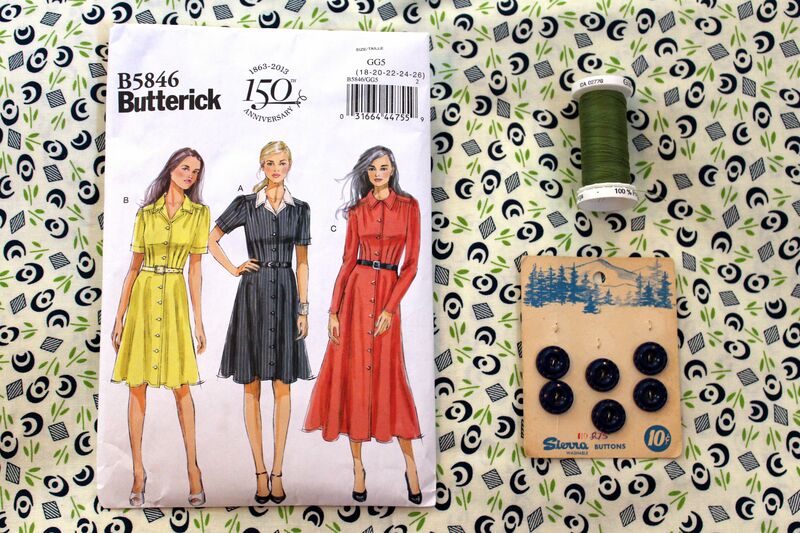 And since I’d successfully made a beautiful teal and navy shirtdress from Butterick 5846, I decided it would be the perfect pattern. How adorable is this fabric? The navy blue buttons are vintage. The olive green thread is for top-stitching. The fabric is a little heavy but nice and soft. It’s not ideal for a blouse, but I hope it will be OK. And since I’ve already fit the pattern, it should be a quick project. Love that fabric, can’t wait to see the finished blouse! Oh, yes I do love that print. There were more vintage-style prints from that fabric company at Jo-Ann’s. I may have to indulge in a few more!